Make yourself at home at Durban’s warmest place to enjoy family fun and top class sporting facilities. 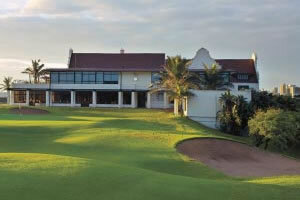 Established in 1922, Durban Country Club boasts a proud history that spans back almost 90 years. Situated only 1 kilometre north of Durban’s “golden mile” beachfront and in the heart of Durban’s thriving sporting precinct – opposite the iconic Moses Mabhida stadium and Kings Park Stadium – the Durban Country Club is the place to meet and have fun. Durban Country Club comprises of two golfing estates separated by the Umgeni River. Lying just south of the river, in fact bordered by both the river and the sparkling waters of the warm Indian Ocean lies the premiere course, the Durban Country Club. Established in 1922 the club enjoys a wealth of fascinating history and was constructed shortly after the conclusion of the First World War. Today the Country Club stands as a shining star among South African courses and was recently voted into the World’s Top 100 Golf Courses by Golf Magazine, USA. The beautiful Cape Dutch Architecture of the clubhouse is now complemented by the modern design of the Moses Madiba Sports Stadium, built for the 2010 Soccer World Cup, to its right and those fortunate enough to play here enjoy stunning views out over the Indian Ocean after a testing round of golf. The course itself is a combination of beauty and brains and will test the skills of the most talented players, as a testament to how much the top players enjoy this course the DCC has been selected to host the South African Open an incredible 17 times and saw, in 2010, Ernie Els take his 5th title there. This semi-links has been sculpted marvellously into the dunes and is covered in an array of tropical trees. The third hole is rated the best in the world and is without the doubt the signature hole. DCC provides a truly wonderful golfing experience and should definitely be added to your list of must-plays.